HiFi + LowFi Mixtape is an American Strong Ale from Stone's Stochasticity Project. It's strong, bitter, and dry. I like it a lot. It pours a bright amber color with average head. The aroma is pine, citrus, white grapes, a little grass. 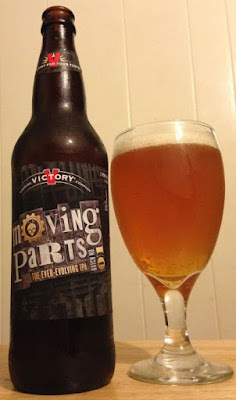 The flavor is mellow malt up front, then very strong and hoppy on the finish. A little astringent, there's some burn and some tingle. A little bit of grapefruit on the exhale. Nice. On a few occasions in my life, I have managed to achieve something I'd been working for, and I've rewarded myself with a new tattoo. Since I began trying to turn my health around almost a year ago I have managed to drop about 120 pounds. (I'm down more than 160 pounds from where I was at my worst ever. I once weighed 330, today I weigh 167). I decided a couple of weeks ago that I've earned a new tattoo, and yesterday, Rob Smith at Caspian Tattoo in Lynchburg, VA, created a new tattoo for me on my left forearm. 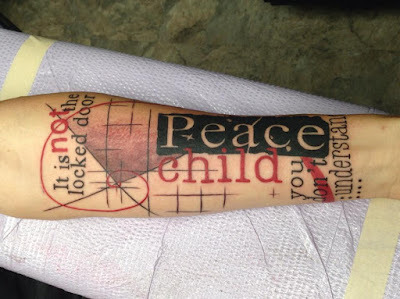 I wrote something on Facebook explaining the tattoo, and the words in it, which reference my very favorite passage from my favorite book of all time. I decided I should cross-post that here at the blog. Most people have a co-worker, or a cousin, or a friend, who is a mountain of a man... some behemoth who towers over everyone else with imposing, sun-blocking presence, and is yet a real sweetheart. Very commonly, that guy's ironic nickname is "Tiny." That's what's going on with Weyerbacher's Belgian-style Imperial Stout of the same name. Tiny is a big, bold, damned strong stout, and it's as sweet, smooth, and rich as it is massive. Tiny pours jet black, there's hardly any foam at all. The aroma is like liquor; strong notes of fruit and sugar and molasses. That's what hits up front in the flavor, and as it warms, coffee and hearty, nutty bread notes show up, too. At almost 12% ABV, you'd expect the alcohol to be big in the flavor. It is. That's fine. 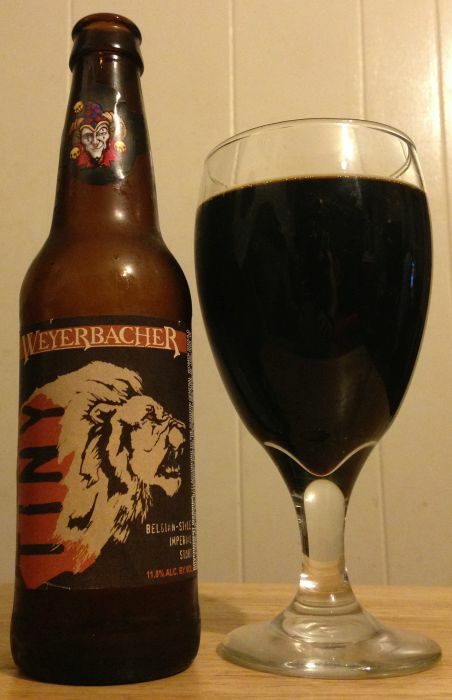 A slow sipping stout is just right now and then, and Weyerbacher's Tiny was just right tonight. Sierra Nevada can just about do no wrong. I'm not usually crazy about spiced stouts, but this one could change that. 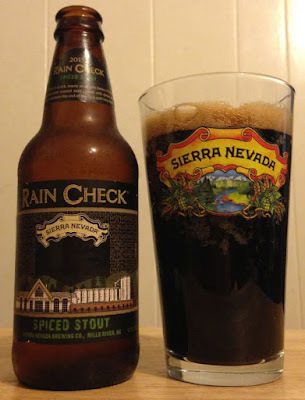 Rain Check does not overplay the spice at all, it's a really rich and strong stout with a spice kick on the back end that gives it a little something extra to set it apart. It pours jet black, there isn't a lot of head. The spices in the aroma are fairly strong up front, and I was worried that the flavor would be overwrought. It isn't at all. The flavor is just right. The rich, roasted malt on the front of the tongue goes down really smooth, and on the finish the spices hit. It isn't overly strong, just kind of an insinuation of allspice, ginger, a little anise, a little bit of tea. It's there on the exhale, it's unavoidable but not overwhelming at all, just this extra bit of spicy, herbal character that sets this beer apart. Narwhal, SN's best stout, is better than this ... but not by much. I'm almost always tired of spiced beers before I finish the glass, but I could drink this one all night. Avery just never disappoints me. I’m not a huge fan of quads, I tend to enjoy dubbels more. Quads can be too sweet and rich for me. 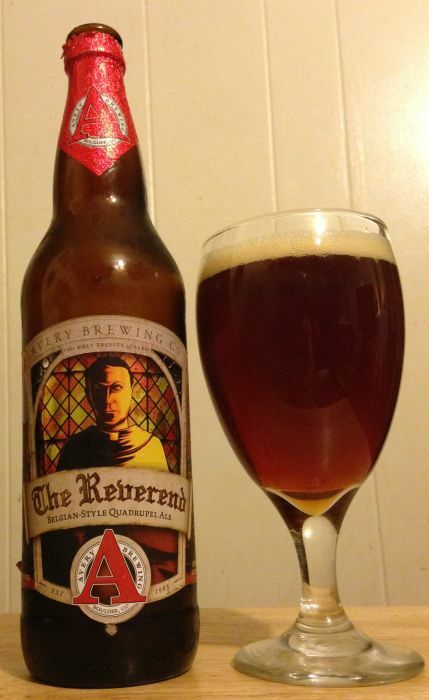 But Avery's The Reverend Belgian Quad style ale one is perfect for my taste. This beer pours the color of strong iced tea, with about as much foam. The aroma has spiced notes, oranges, mild coffee. The flavor adds yams, caramel, apple-butter. It’s sweet, but not overly so. Not extremely rich. The 10% ABV is hidden in the smooth malt backbone. Well done. 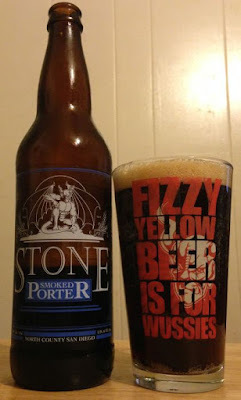 I was surprised to realize recently that I had not reviewed Stone's Smoked Porter, but I shouldn't have been. 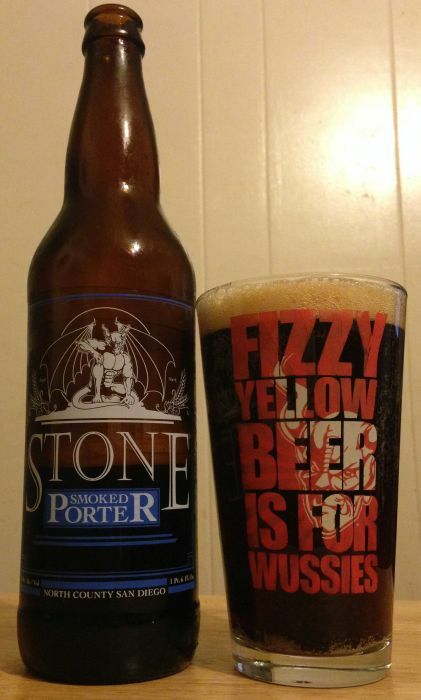 This is not my favorite Stone beer by a long shot, and certainly not my favorite example of the style. Having said that, I can't say it isn't enjoyable. This porter pours chocolate brown with an average splotchy head, average lace and low carbonation. The aroma is smoky malt, coffee, some caramel. The flavor is hoppier than many porters, the malt is more reserved (this is, after all, Stone). The coffee and chocolate mentioned on the label come through in the finish. I like porters for rich, semi-sweet malt. My very favorite porter remains Sierra Nevada's year-round release. 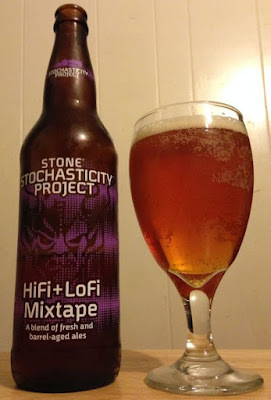 I like Stone beers for big, hostile hops. This is neither a great porter, nor a great Stone Brewing beer, but it isn't bad. God almighty. 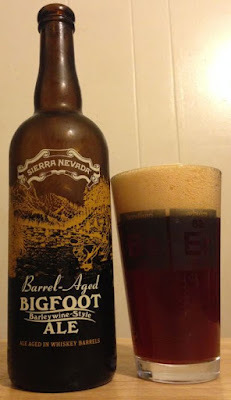 I'm a Sierra Nevada fanboy, I should admit that up front... but this special release, Barrel Aged Bigfoot Barleywine, might be the best thing I've ever had by the brewery. Barrel Aged Bigfoot is more than just SN's classic barleywine plus vanilla/oak notes. This is a complex, boozy monster that leaves a storm in your mouth well past the swallow. It pours a brilliant, deep amber color with a lot of foamy head. The aroma is caramel and vanilla and booze, with a candy/molasses backbone that only hints at the good things to come. The flavor is warm and woody on the front, then brings a flood of sweetness. Figs, vanilla, walnuts, gingerbread, and then a big, aggressive whiskey blast on the finish (12.2% ABV). The mouth feel is even thicker than original Bigfoot. This is a beer to sip, not to guzzle. It's only available in seven-fifties, and one of these is plenty for two or three people. I hope I can get a couple more bottles to sip on before this release is all gone. An hour before the Oh!lly 5K Trail Run, my son and I walked the first quarter mile or so of the planned course. The same thought was repeating over and over in my head... "This is not a running path. This is a hiking trail." Running tracks, as I'd come to know them, were wide and even and flat. Gravel or paved surfaces, or at least flat dirt, and wide enough to drive a car on if you had to. Or, God forbid, an ambulance. This trail, however... this was a hiking trail. And I am qualified to point out the differences, having hiked hundreds of miles of trail over the past year. This trail was narrow, maybe two feet across. It was steep and rocky. It was uneven and hard, and it was full of roots that stuck up in inverted U shapes about four inches, just right for catching a foot and bringing a face down to foot level pretty quickly. I stood on the trail and lazily kicked at one of those roots, and optimistically told my son that a root like that would be a good way to get a middle-aged fat guy killed. A middle aged fat guy like me. My son was helpful. "Well, try not to get killed out here," he offered. It was in nearby Charlottesville. It was scheduled for my day off. 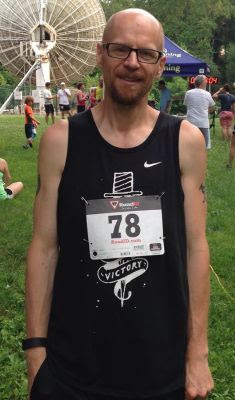 The Charlotesville Area Trail Runners club made it sound like a tough but fun race. Now, with minutes to go, I was walking the trail and wondering what I'd gotten myself into. I'm not wild about black lager and I haven't enjoyed much organic beer, so I didn't have high hopes for Uinta's Baba Organic Black Lager. 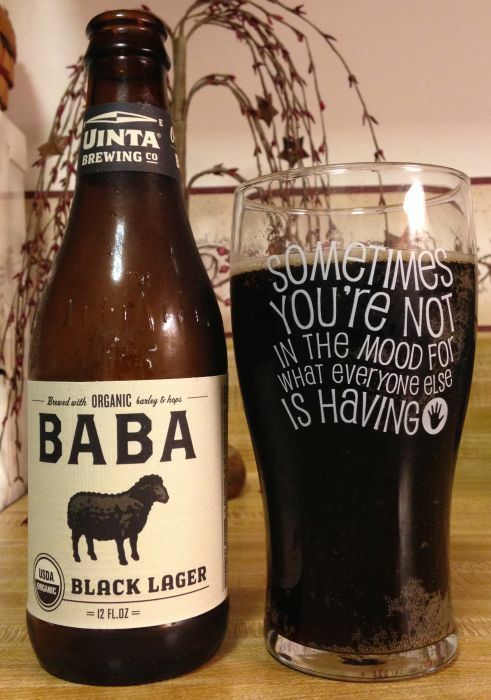 But Uinta is a brewer that generally pleases me more than not, so I gave gave this a try. I liked it. It pours thin with a trace of head, the aroma is a burnt malt with a charcoal character, maybe a little hop tingle in the background. The flavor was stronger than I'd expected, and slightly sweet. Something here reminded me of Dr. Pepper and coffee. Nice. 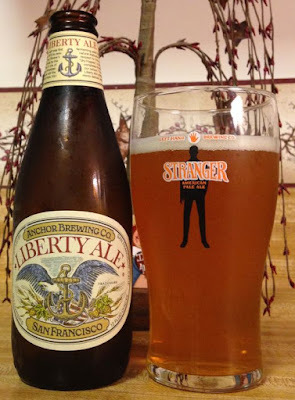 Anchor Brewing's Liberty Ale is not awful, but it's nothing special. This is the least memorable Anchor beer of the few I've had. This ale pours golden tan in color, the head is average. The aroma is indistinct. The flavor isn't offensive but isn't memorable. A little bit of floral hop, a little bit of malt, thin finish. Flying Dog's Bloodline is an IPA brewed with blood oranges. I liked this quite a bit. It pours a golden, bright orange color with average head. The aroma as musty and bitter. My girlfriend said it smells "like dirty gym socks," and she couldn't understand why I nodded with appreciation and said "Yeah, awesome!" The flavor is strong and very bitter up front. Floral pine, all hops, no real malt to speak of. Then on the finish there's a blast of sweet orange zest. I couldn't wait for each next sip. I’m not a huge fan of the style, saisons are often too delicate for me. So I love Stone Saison for being fairly aggressive. It pours a hazy goldenrod color with a huge amount of foamy head. The aroma is rich malt, grapes, grapefruit, floral notes. The flavor is dry and hoppy. Lemon and spice over the malt, with a bright, crisp finish. 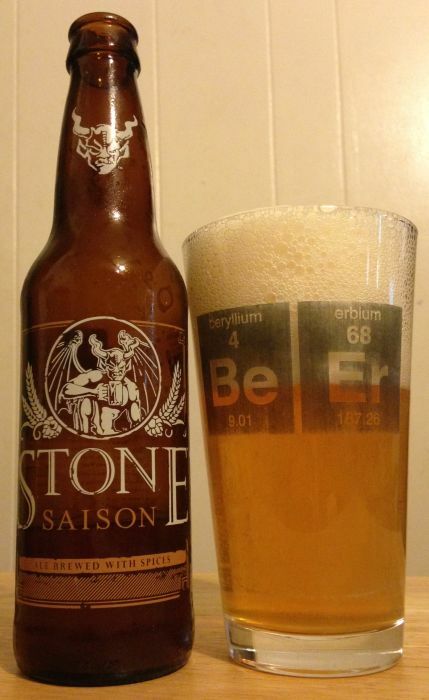 This might not be a classic example of the farmhouse ale style, but it’s a great example of what Stone does well. 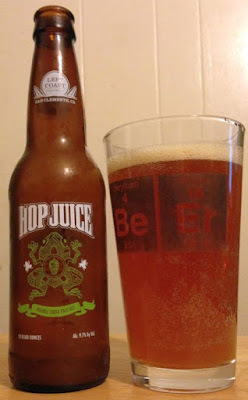 Left Coast's Hop Juice Imperial IPA t tastes filthy. I really like it. It pours a murky gold color, there isn't much head, and the foam fades quickly. Mild, sweet citrus in the nose, not much else. The flavor really brings the complexity. That citrus hits up front, then dense, warm malt. The finish is a musky, strong hop overload. Vegetable and grass notes dominate. 9.7% ABV is apparent. Good beer. 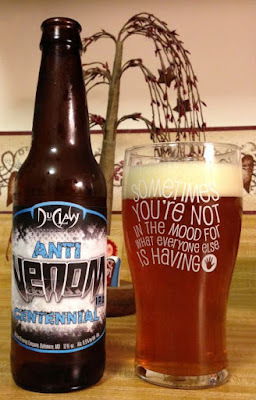 DuClaw Anti-Venom Centennial is an OK IPA, nothing special. 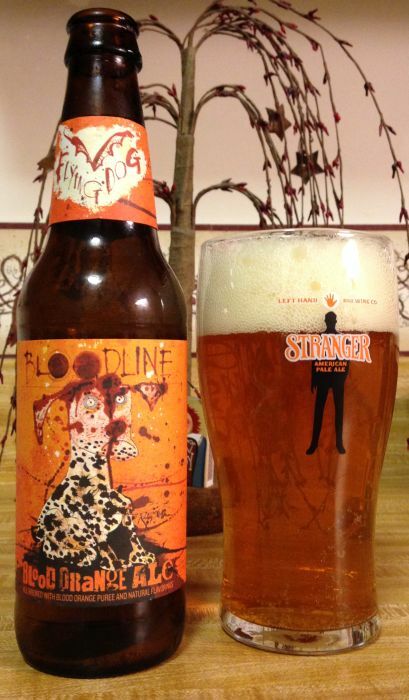 It pours pale orange in color, average head, the aroma is lemons and a little pine, a little mild malt. The flavor is crisp, bright, a hint of honeydew melon, then a watery finish. It wasn't awful. It wasn't great.